This short sleeve unisex polo comes in sizes 4-20 and features a three button placket with dyed to match buttons. Long Sleeve polo with three flower button placket. Picot trimmed collar and ribbed cuffs. Machine washable. Dickies Short Sleeve Polo fits boys and girls and comes in 15 colors. The front placket features three dyed to match buttons. This cotton/poly blend polo shirt also has stain release and no exterior logo. A very popular item, the French Toast Girls Polo has flower shaped buttons. A rib knit collar with picot trim and ribbed cuffs for added style and comfort. Machine washable and available in four popular school colors-White, Blue, Yellow, or Burgundy. Classic Peter Pan rounded collar short sleeve blouse with button front. Cotton blend with "Wrinkle No More" fabric. This short sleeve unisex polo comes in sizes small to 2XLarge and features a three button placket with dyed to match buttons. 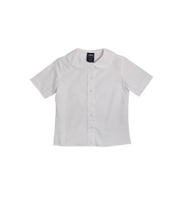 The Short Sleeve Uniform Blouse from School Apparel features a pointed collar with dyed to match buttons. Made from a 65/35 poly cotton blend, it also has a one piece back and a no pocket front. Three basic school colors-white, blue, or yellow in sizes from Youth 4 to Adult 3XL. This long sleeve unisex polo comes in sizes 4-20 and features a three button placket with dyed to match buttons. Has 60/40 cotton poly blend, three button placket and Dyed to match buttons.